It was a freakish, just-one-of-those-things event: During scheduled maintenance inside a spiral freezer at Tyson Foods’ Pine Bluff, Ark., plant in February, a spark from a welding torch ignited the conveyor belt and fed a blaze that shut down production the following day. Freakish, perhaps, but not especially unusual. In December 2009, a flaming piece of tortilla bread discharged from an oven at the Moncton, New Brunswick, bakery of Fancy Pokket Corp., igniting a plastic conveyor belt. Damage was inconsequential compared to the previous year’s Easter Sunday blaze that destroyed the Cargill Value Added Meats facility in Booneville, Ark. The 150,000-sq.-ft. plant, valued at $100 million, never produced again, idling 800 workers. A burning conveyor belt leading to a spiral freezer was the fire’s source. Yet another food plant fire involving a plastic belt was highlighted in a loss-prevention publication from FM Global, a Johnston, R.I., insurance underwriter. 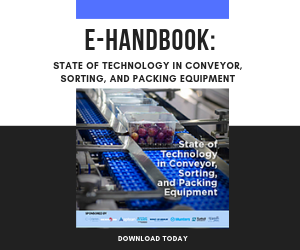 As described in the 2012 publication, the fire at an unnamed processor of food coatings and seasonings originated in a 10 x 30-ft. oven constructed of noncombustible materials, save for the conveyor belt. Two sprinkler heads in a nearby dust collector limited property damages to about $200,000, though the article suggested the firm bore some liability for allowing waste ingredients to build up and for not installing sprinklers inside the dryer. Plastic belting can be injection molded or constructed of polyethylene or acetyl, and, as with any petroleum-based product, they are flammable. Conveyor suppliers understand the flammability potential, but the issue rarely comes up in discussions with food clients. The only time fire danger is discussed, says John Kuhnz, business unit director at Dorner Manufacturing Corp., is in the context of an explosion-proof conveyor the Hartland, Wis., firm makes. The flexibility and functionality of plastic belting have made plastic the material of choice in many food conveying applications. But insurance underwriters certainly are aware of the potential danger, warns Kenneth King, commercial support manager at belt supplier Ashworth Brothers Inc., Winchester, Va. Manufacturers should be cognizant of the liability issue, particularly when belts run in an enclosed area. “If plastic is used in a spiral freezer or other enclosed space, you’ve basically got a big, enclosed candle,” he cautions. Food processors prefer to focus on other conveyor features, such as maintenance needs, energy consumption and space requirements. Cleanability is a major issue, and few suppliers have failed to design units that are not compatible with the higher sanitary requirements in today’s operating environment. That was the focus at a Muskegon, Mich., firm that had a toehold in secondary packaging and other noncritical areas of food plants but wanted to branch into processing areas. Jason Grobbel testifies to the cleanability claim. He is president and a fifth-generation processor at EW Grobbel Sons Inc., a Detroit corned beef specialist with roots that predate Henry Ford. Grobbel installed a horizontal unit from Dynamic in 2013. As other conveyors come due for replacement, Grobbel intends to replace them with Dynamic’s solution. Dynamic had to drop the major advantage of its mainline conveyors — reconfigurability — to achieve the cleanability demanded by food processors. Comparing the original units to Lego bricks, Batka explains the bolts required to break down and reassemble the conveyors in a new shape provided harborage points for bacteria, so they were engineered out of the sanitary line. Nonetheless, the so-called DynaCon system can be found in secondary packaging applications, such as bottle blowmolding at Pom Wonderful’s facility in Fresno, Calif.
Dorner Manufacturing staked out the sanitary design turf when it entered the food equipment sphere, but sanitary design is no longer a distinction but a prerequisite of food applications today. Now, the emphasis is on cost effectiveness, single-vendor sourcing and manufacturing flexibility, reports Kuhnz. “We’re doing quite a bit of controls work now,” he says by example. Whereas manufacturers might have preferred stripped-down units in the past, which then were integrated into the conveying system at their plants, today they are specifying the inclusion of a control system or at least logic zones, emergency stops and other elements for a plug-and-play installation. In response, Dorner has staffed four electrical engineers to beef up its in-house capabilities. Tired of finger-pointing when multiple vendors are involved and a problem occurs, food companies are moving toward single sourcing for conveying, according to Kuhnz. As a result, the firm’s controls work has increased by a factor of five in recent years. Rising energy costs are encouraging food processors to take a more critical look at the efficiency of their drive systems. While no single solution is appropriate for all applications, the differences in energy costs can be profound. Switzerland-based Interroll, with U.S. offices in Hiram, Ga., touts a recent study at the Institute for Conveying Technology and Logistics that compared conventional 400-volt drive technology with 24-volt systems (Interroll manufacturers 24-volt roller drives). The study concluded 24-volt technology is 30 percent more efficient in intermittent operation and 50 percent more efficient during accumulation. Line flexibility and compact design are priorities for many food companies. Both needs are addressed with Dorner’s new series of flexible chain conveyors that incorporate powered micro pitch transfer modules that accommodate half-inch gaps at transfer points. Instead of a matt top, the 300 series stainless belt is linked together on a center column that delivers a 600-lb. load capacity and a tighter turning radius. Kuhnz describes the 7100 series as a cost-effective solution for bakery applications and packaging areas, where multiple lines might need to be merged into a single lane running at 240 ft. a minute. Bob Maine (center) confers with colleagues at Cambridge Engineered Solutions’ fabrication shop in Cambridge, Md. Extended service life and reduced maintenance traditionally were the design drivers for metal belt manufacturer Cambridge Engineered Solutions, Cambridge, Md., and those features remain priorities in many of the industries the company serves. But production drives food processing, believes Bob Maine, director of engineering, and resolving production issues is Cambridge’s focus when developing solutions for food. Reducing ingredient loss is an example. All of Cambridge’s belts are designed for processing applications — “We don’t do any general conveying,” Maine says — and the more open the mesh of belts for breading and enrobing applications, the better. That allows more excess ingredients to drop below for recovery, rather than sticking to the belt and becoming waste. “We have a lot of metallurgical experience on staff,” he adds, and belts are fabricated of 200 or 300 series stainless steel, depending on the application. Bakeries, breweries and poultry are among the food categories Cambridge serves. Cambridge’s belts can be found in -300°F cryogenic tunnels and +800°F tortilla ovens (those belts are rated at 1100° to withstand cleaning, when bakers ramp up the heat to burn off any waste materials that adhered to the belt). A recent innovation is the Duraflex Edge, which features a clinched edge design. USDA dairy certified with meat and poultry certification pending, the belt is a response to problems some poultry processors were experiencing when metal fragments broke off from the edges of older belts. The challenge was engineering a clinched edge without pinch points that would still drain easily during cleaning. The elephant in the room when discussing desirable conveying features is cost. If conveyors were Chevys, not only would there be a wide gap between a Corvette and a Spark, there would be many options in between. Model selection comes down to tradeoffs between features and price. The same can be said about conveyors. Precise metering of multiple ingredients with horizontal-motion conveyors makes the FastBack blending conveyor an alternative to drum tumblers. The compact mixing drum (upper left) can be positioned directly over a weigher to reduce system footprint. Photo: Heat and Control Inc.
Offering food processors multiple options is driving innovation at Heat and Control Inc., Hayward, Calif. A recent example is the FastBack blending conveyor, an adaptation of the horizontal-motion units with direct drives that the company introduced 18 years ago. Multi-head weigh scales are more precise, but they cost more and can’t handle as many ingredients as an expandable system of blending conveyors. The blending conveyor is finding a niche with frozen vegetables and snacks such as trail mix. Vibratory conveyors excel with sticky products, but if breakage is a concern, horizontal motion is the answer. “This really appeals to snack foods because it doesn’t break up the product at all,” says LaManna. Another application of the technology is the WeighBack, Heat and Control’s alternative to weigh belts in mass flow measurement. Designed for applications like product delivery to seasoning applicators and inline weighing, the unit’s load cells come within 2-4 percent of target weight while conveying at up to 40 ft. per minute. The key advantage is lifecycle operating cost: Cleaning and maintenance costs are more favorable than conventional solutions to mass flow measurement, says LaManna. A new version of the inertia drive is featured on the FastBack FDX, shorthand for force displacement drive. LaManna describes it as “a niche-market drive unit for accumulation or transferring product a long distance or with a heavy pan.” Instead of multiple eccentric drives, a single FDX drive using rotating weights on a vertical shaft can handle pans weighing up to 2,500 lbs. and convey product over 100 ft. at 30 ft. per minute. Drive belts also mean low noise levels, he adds. Plastic belts have made significant inroads in spiral freezer applications, replacing steel belts in part because of their lighter weight and lower maintenance and repair cost. But Ashworth's King maintains those factors fail to account for the total cost of ownership. Plastic belts require more cage drive speed than metal, raising energy consumption, he says, and few if any processors factor in the fire-containment costs, higher insurance premiums, or increased liability those belts may require. When Ashworth introduced a hybrid belt made of plastic and stainless steel in 2006, it followed industry practice by affixing a warning label about the belt’s potential combustibility. Those labels help limit the fabricator’s liability, but they also are a caution for food manufacturers. “Do customers take it seriously enough to speak with their insurance companies and investigate what their liability is?” King asks. Only the end user can answer; he just hopes the cost of adequate fire protection is factored into the selection decision.